By Chris Williams: WBO light welterweight champion Timothy Bradley (28-0, 12 KO’s) no longer has to dehydrate himself to make 140 now that he’s moved up in weight to face WBO welterweight champion Manny Pacquiao on June 9th at the MGM Grand in Las Vegas, Nevada. Bradley says he’s weighing at 165 right now with it all being muscle instead of fat. This could be bad for the Filipino fighter. I have a bad feeling about this for Pacquiao. He’s starting to deteriorate as we’ve seen lately, barely won in his last fight by a gift decision, and is ready to be picked off by and taken down for a kill by the young lion Bradley. It’s what happens in boxing. Pacquaio has taken down some old lions in Oscar De La Hoya and Antonio Margarito. Now it’s Pacquiao’s turn to be worn down and ripped to pieces by the younger 28-year-old Bradley. The legs are going, the speed is decreasing, the work rate is down and the defense was never the there to begin with for Pacquiao. I just wonder what kind of tricks his trainer Freddie Roach can come up with to get Pacquiao through this fight, because Roach has been striking out recently with his fighters Amir Khan and Jorge Linares taking losses. Roach has looked paralyzed to come up with useful advice for his fighters. It’s like the guy comes in with Plan A, and then starts stuttering when he needs to have his fighters shift a gear to get into a plan B and C.
Bradley will slightly shorter than Pacquiao, but if he balloons up to 165, he’s going to tossing Pacquiao around the ring like a rag doll on June 9th. Their promoter Bob Arum will be looking at the big money that he could have received had he simply agreed to put Pacquiso in with Floyd Mayweather Jr. go up in smoke with Bradley beating Pacquiao. A loss for Pacquiao means a bout against Mayweather will never likely happen and if does, the cash will be a fraction of what it once would have been. 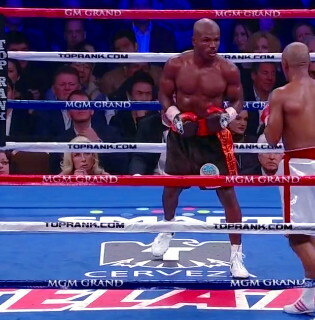 Mayweather wouldn’t even be in the equation because Pacquiao would be tied for a year trying to avenge the loss. Can you imagine what another loss for Pacquiao would do to him? He’d have to go into retirement and Arum would then look to have Bradley take over for Pacquiao.